OnePlus 3 is yet another great looking smartphone with a brilliantly low price. The OnePlus 2 was a fantastic phone but as technology advances, new device comes out with much better specification. Last year, OnePlus underwent a lot of criticism for losing NFC and the OnePlus 3 has brought it back on board. Although we own a beast, we humans always want more & powerful. People who love to tinker with their device will end up thinking of Rooting their brand new device. Rooting not only provides more power but also better battery. It allows you to remove Bloatware, install custom ROMs, flash different Mods, increase your device’s connection speed & the list goes on and on once you starting digging through the advantages. 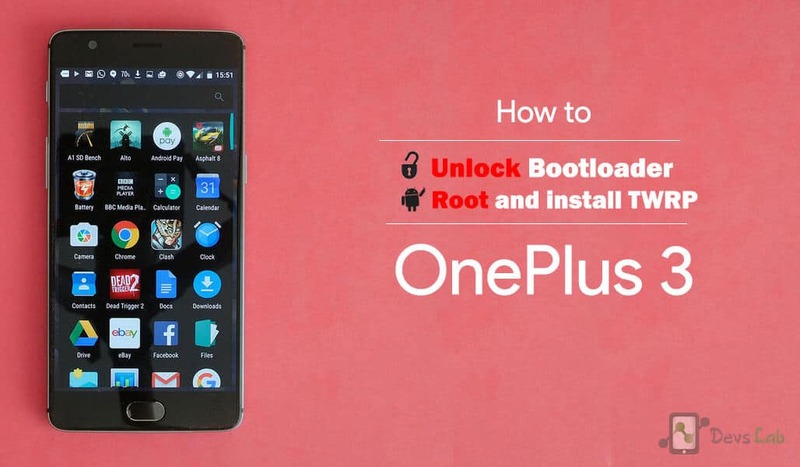 So today we’re here with most simplest & 100% working method for How to Root OnePlus 3 easily! Note: You warranty may get void after following this procedure. We won’t be responsible for anything happening to your device during this process as you are the one who have decided to do this modifications. All the steps mentioned below are tested & found to be working perfectly! Make sure to read & follow each step carefully. Follow procedure mentioned in this article to install ADB files – Minimal ADB & Fastboot Files. Download & install OnePlus 3 drivers as mentioned in this article – ADB USB Drivers. Unlocking Bootloader erases all your data i.e its does a Hard reset. Make sure you backup everything before following any of the steps mentioned below. Stage 1. Unlocking Bootloader of OnePlus 3 through ADB fastboot. Unlocking Bootloader allows flashing third party softwares & change system files from fastboot only. Stage 2. Installing TWRP 3.0.2 Custom Recovery in OnePlus 3. 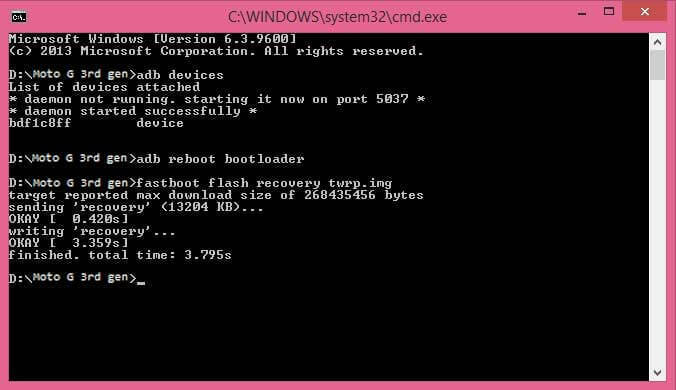 By installing TWRP recovery, you can flash custom zip files like Custom ROMs, SuperSU, MODS & tweaks. Stage 3. Flashing SuperSU file to gain Root in OnePlus 3. SuperSU hooks into your system files & acts as an intermidiate between apps that require root access & system files. Step 1. Follow the ADB installation method given above & launch adb.exe from Minimal ADB & Fastboot folder in installation directory. Step 2. Connect your device to your PC by enabling USB Debugging mode (Settings>Developer Options) If you can’t find Developers options, Goto Settings > About Phone > Tap the build number for 7 times. Step 3. Type the below code in the command prompt / Terminal. If it will returns a device code, you’re all set to proceed. Step 4. Type “adb reboot bootloader” to boot your OnePlus 3 in Fastboot mode & Connect your phone to your PC via usb cable. Step 5. Type the below code in the command prompt / Terminal. The device will now go through the automated unlocking process. Wait for the process to complete. Follow the onscreen Notifications. Step 1. Copy the downloaded TWRP image file from above link to ADB fastboot folder. You have successfully installed TWRP recovery in your OnePlus 3 device. Step 1. Transfer the downloaded SuperSU zip file in your device’s internal storage. Now switch off your device & boot into Recovery mode by pressing & holding Volume down + Power key simultaneously. Step 2. Tap on “Install” option from TWRP recovery menu. Locate the transferred SuperSU.zip file from the file explorer. Step 3. Tap on the SuperSU file & wipe right to confirm flashing the zip file. Wait for installation to complete. It hardly takes 30secs. Step 4. Now switch on your device & you’ll find SuperSU app. To verify if you have gained root access, download Root checker App from Playstore. Also read: How to install Dolby Surround sound in rooted Android device. Now that you have rooted your OnePlus 3, you can checkout our list of Top 10 Apps for Rooted Smartpones. You can also install Xposed Framework & change System files without installing Custom ROMs. Don’t forget to install Greenify to hibernate battery hogging apps like Facebook & Messenger. If you are stuck at any point, you can comment your query below.